Prince William alongside in Fredrikstad at the end of the Tall Ships' Race 2005. Prince William's rig was designed according to traditional rules and is occasionally modified slightly with trainees in mind. The foremast is slightly shorter than the main mast, but they are otherwise identical. Each consists of a steel lower mast and topmast and timber topgallant and royal mast. Spars are steel on the lower and topmasts (course, lower topsail and upper topsail yards) and timber above this (topgallant and royal yards). Access to the tops is by a vertical "jacob's ladder" down to the ratlines, rather than inverted futtock shrouds. 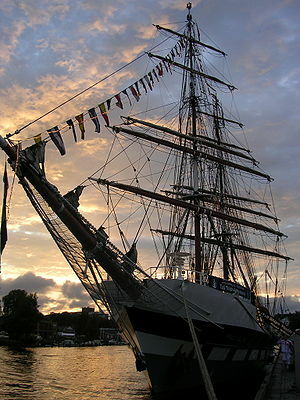 There is a gold sovereign placed under the foremast where it meets the keel, a tradition supposed to give the ship luck. The first sighting of Excelsior as Prince William closed to offer assistance during the 2005 Tall Ships' Race to Norway. Prince William competed in the 2005 Tall Ships' Races. 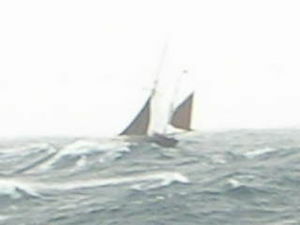 She came fourth in class (of 25) and fourth overall (of 100+) in the first race from Waterford to Cherbourg. In the second race, from Newcastle to Fredrikstad, she suspended racing in order to answer a distress call from another vessel, the Lowestoft trawler Excelsior which was in danger of losing her mast and sinking. The Prince William, which is registered as a UK Auxiliary Coastguard vessel, stood by Excelsior in case of disaster, supplied a portable pump via RIB in large seas and accompanied her into Fredrikstad in case of further damage. Prince William was listed as "retired" by the race authorities, but was awarded a prize for her actions. Prince William completed her final voyage with the TSYT in 2007; its 6th Brig Match Race in Portsmouth, 29 October - 1 November 2007, competing alongside sister ship; Stavros S Niarchos. With bright sunny skies and freshening winds, the two majestic brigs battled it out over a series of four races on courses set towards Cowes on the first day and Sandown Bay on the Isle of Wight on the second. In the end, Captain Liam Keating on Stavros S Niarchos took home the Tall Ships Challenge Cup having closely beaten Captain Roy Love on Prince William 2-1 (one race abandoned due to light winds). She is currently in lay up in Portsmouth Dockyard courtesy of VT and the Royal Navy. And in order to diversify the work of the TSYT, she is to be sold and replaced by 4 22m challenger yachts. The Charity says “The sale of the brig and boost in the size of the fleet will generate an increased number and range of opportunities for people of all ages and abilities to get involved"
This page was last edited on 2 July 2010, at 15:06.